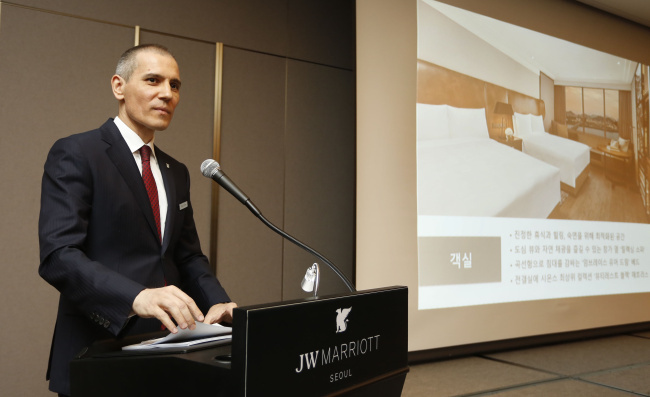 JW Marriott Seoul announced Wednesday that it is now fully ready for business with a new sports complex and two penthouse rooms. The hotel located next to the Express Bus Terminal reopened in August after an extensive eight-month renovation, but some of the hotel’s key facilities and rooms were not ready at the time. “Traditionally, a (hotel) renovation is not done by closing down the whole (property). 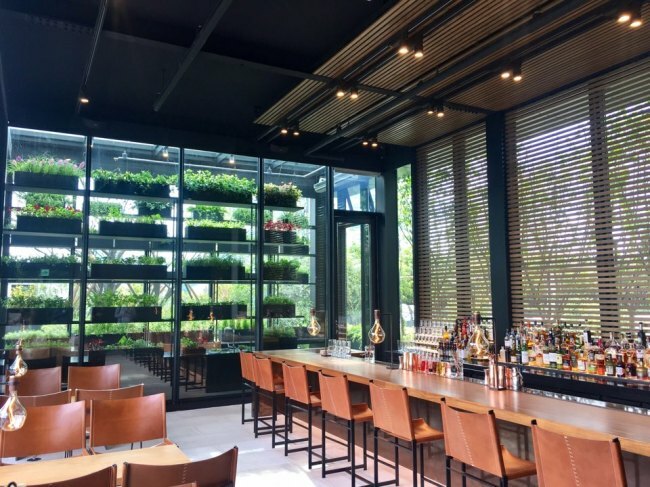 Usually, floors are closed and others are open and (it) takes two to three years,” Radu Cernia, general manager of the hotel, said at a media briefing. “We decided to close the hotel down, because dramatic changes in structure were needed. There have been major changes into the structure, generating a lot of noise and dust,” Cernia said. Following the renovation, the number of rooms have been reduced from 497 to 379. Two of the rooms are duplexes that are equipped with exclusive elevators: the Presidential Penthouse (278 square meters) and Ambassador Penthouse (278 square meters). The Marquis Spa & Fitness Club occupies nearly 14,212 square meters, from the second to the fourth basement floors. The sports facility features an exclusive restaurant, a full-size swimming pool, a scuba diving pool, a basketball court, a squash court, a jogging track and a Pilates room. The general manager emphasized that the hotel aims to satisfy the five senses. “From sight to scent, everything that guests see, hear, smell, taste and feel here has been addressed by our hard work. When we make them feel special, this is a true luxury experience,” Cernia said. “I remember a stay at a hotel in Bali around 10 years ago. To this day, I still remember the scent and the music. The two senses may be the most powerful ones for humans, as they last for a long time,” the artist said. “The music lists are to be updated every month. I suggest those who visit the hotel to look around the property while carefully listening to the music,” he said.